On the left we have the "Shiny" lasercut RepRap/RepStrap, completely fitted out with ball-chain drive and it all feels just fine. No rattly movement, though some of the screw heads are catching in the Y motor coupling and motor mount. I'll have to add a few washers or shorten the motor-mount/frame coupling bolts. 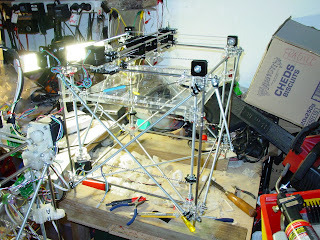 The Z drive was tested by connecting it to Phoenix and using the Arduino electronics on there (you can see the Y stepper controller on Phoenix's frame lower far left). The Y and X axes were tested by engaging my electric screwdriver in the adjustment slot at the rear of the motors, and whizzing it back & forth. Not a full-on electrical test, but the mechanics should do the job. I have also properly fitted the NEMA17 motor to the X axis on the now fully-assembled Phoenix, and that checks out okay - and I printed an ABS cat. All in all a very busy weekend. Revised Z Axis with Bearings etc. How does it go ?? Looks like it moves just fine. Mind you, I've got some fabbed bearings coming up - I've already fitted RepRapped bearings to Phoenix. We'll still need some skate bearings, but I might be able to drop it to 5 per RepRap or thereabouts as opposed to about 16.